Just a reminder that some of the stores in KOS have a event quota to meet. If you are not interested in running RP events to promote roleplay, you should leave the businesses, and let other people to take over who may wish to do so. If you haven’t run any event for a while, you are breaching the RP rental agreement, and Ireem will repossess the store. If you are willing to comply and run events, please contact me (Kora) by Wednesday and let me know what event it is. THIS is a MINOR release. Apparently today SL is misbehaving, so I quickly released an upgrade to help with a possible delay in connecting with the external database. However, if SL Is bad and it doesn’t connect with the external world, there isn’t anything I can do about it. This is not a mandatory release. Now, the code for safezone is updated everywhere. If you are in the middle of a fight/capture (so your stamina is less than your max ), you won’t be able to set your meter to safezone. This way we hope that people will not try to run to safezones when they are about to lose anymore. Once you click on the safezone, there won’t be any delay to process the safezone anymore. Have you forgotten to compliment other players? And now you cannot do it anymore because they left the SIM? If this player is offline or in a different region, s/he will receive an Instant Message about it. If this player is in the same region, s/he will receive a popup window with the message. Also when you enter a region, there will be a reminder in your local chat about the people that you cannot interact with (either by your or their request). Upgrades are always free and available in the Game Room at the entrance of the SIM. Please do upgrade, but this release is not mandatory. This release will address the issue of switching to OOC/Training Mode while in a fight/capture, and to run to a safezone. This release will soon become mandatory. And afterwards, the safezone will become instant, and not more delayed, if and only if you are not in the middle of a fight/capture. Upgrades are always free and available in the Game Room, at the entrance. Touch the upgrade sign to receive an upgraded SGS KIt. 3 new Crossbows are released now. They are version 2.10, and when they get updated, you should automatically get a new update. – Anybody can participate (NON-SGS Players are welcome too). Themed clothes are required. – Any passengers (including pilot) will be able to shoot by entering in Mouselook and clicking on the MOUSE. – You will read a message in local chat to see if you hit anything and the amount of inflicted damage. – No need to wear any specific weapon. The vehicle is scripted to shoot. – Your carpet has an armor/health of 100%. – You will be able to restore your carpet’s armor by colliding the magic health ball you will see in the sky. – If they shoot at your carpet, you can try to skip the arrows/bullets or just collide on them (and they will lose health). – Any strategy is okay. – Last carpet standing will win. – You can train from now on by clicking on a jar in the desert and rezz a carpet and find someone else willing to train with you. Type /77 START in local chat to begin moving. Type /77 STOP in local chat to stop moving. Type /77 HELP in local chat to display help. Enter MouseLook to start shooting (magic spells) to hit other carpets. All passengers of the last standing carpet will win a SGS CHAMPION SWORD. If any member of the winning team is not a SGS PLayer, s/he will win a SGS meter/hud as well. The champion sword is the biggest sword available and it is scripted to be slightly more powerful than any other weapon. The champion sword will expire after one month. This sword is available on display in the game room. If you are single, you will join a matchmaking board and we will pair you up with a dancing partner every 2 songs or so. Event is in theme (medieval Middle-Eastern) but it is going to be OOC. No need of meters or explorer tags if you are in this event on the Isle of Mer. If you are not participating, then you will be IC in the rest of the sim. Several people asked about the Fen Beast. The Rideable Fen Beast is now available for sale in the room above the Game Room – on the boat at the entrance. – the CHAMPION SWORD (the biggest and most powerful sword of Ireem). or until the next tournament (whichever comes first). Are you a true champion? Fight for yourself and your group. – Anybody can partecipate. Dress in theme. THere will be an event soon, but in the meantime, if you wish to practice, I left a flying carpet dispenser jar in the desert. It takes up to 4 people. The first one to sit is the driver. All of them – once in mouselook – can ‘shoot’ at other carpets. No need to wear a weapon. Once your carpet loses all armor, you get ejected from it and fall on the ground. 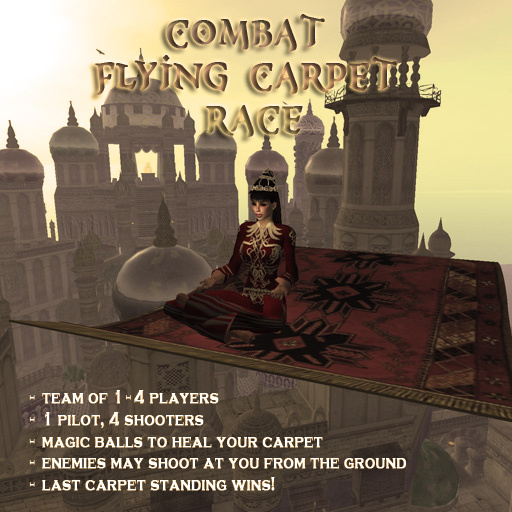 People from the ground may shoot at the carpet with bows or other range weapons. Then you can hit with the carpet if you want them to lose health.